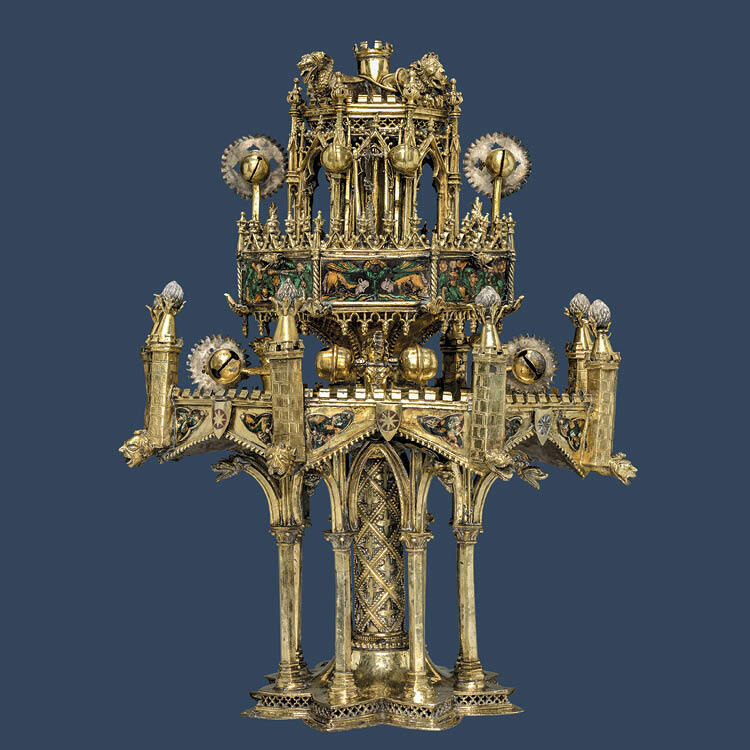 One of the great signature objects of the museum’s medieval collection is a gilt-silver automaton, the most complete surviving example of what is today commonly known as a table fountain. This elaborate object fascinates all who see it. Given its extreme rarity and the lack of comparable examples, early scholarship on the Cleveland table fountain introduced many speculative interpretations and misunderstandings about its origins, history, and functionality. The exhibition Myth and Mystique: Cleveland’s Gothic Table Fountain takes a new approach to address lingering questions by placing the fountain in the context of some very special loans. Cleveland’s table fountain is above all a piece of Gothic architecture in miniature, with parapets, arcades, vaults, pinnacles, columns, and traceried arches. The goldsmith responsible for its design and manufacture was unquestionably inspired by the great Gothic buildings of his time. This deluxe object made of precious materials with rich detail and ornamentation would have been expensive to produce and highly treasured by its original owner. Stylistically datable to the early 1300s, the fountain was undoubtedly produced in Paris for a person of high status, perhaps a member of the royal court. Table fountains are now understood primarily through documentary sources such as inventories and wills, which inform us that they once existed in substantial numbers. King Charles V, Queen Jeanne d’Évreux, and Duke Louis I d’Anjou all owned examples. King Charles V of France entertaining the Holy Roman Emperor, Charles IV, and Wenceslaus, King of the Romans (detail, folio 473 verso), from the Grandes Chroniques de France, 1378–79. Tempera and gold on vellum; 35 x 24 cm. Bibliothèque nationale de France, Paris, MS. Fr. 2813. 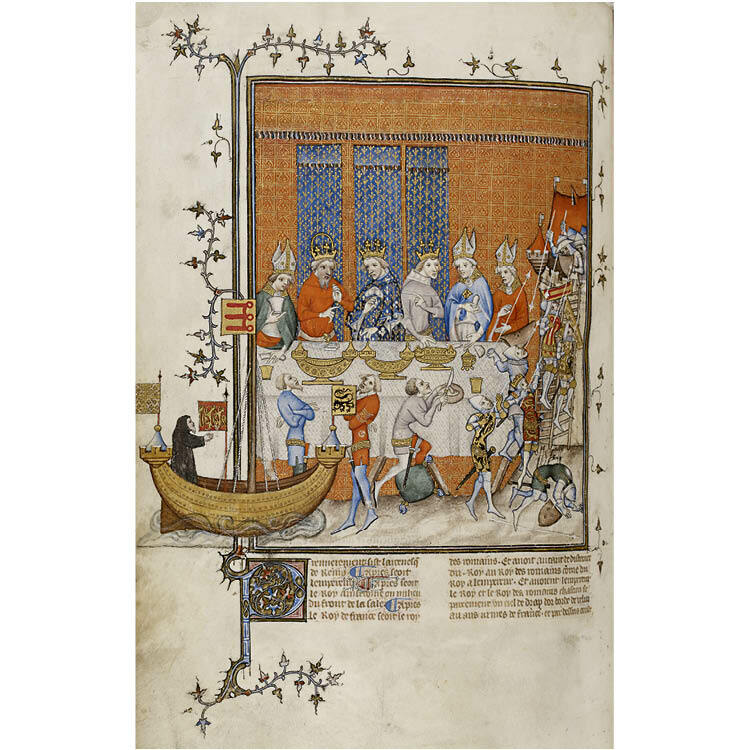 The Grandes Chroniques is a vernacular history of the French kings assembled from translated Latin chronicles and other medieval documents and commissioned by Charles V. Banquet scenes like this famous example abound in medieval manuscripts. While they often depict lavish plates and vessels, none depict table fountains, suggesting that fountains were not deployed on banqueting tables. The Cleveland fountain operated hydraulically and originally stood in a large catch basin. Pumped through a central tube, scented water would have emerged at the upper turret and through a series of nozzles (shaped as animals and drolleries), creating water jets that then forced waterwheels to turn and tiny bells to ring. The water would have gradually cascaded from one level to the next through drains shaped as gargoyle heads into the catch basin below. The water source was likely supplied through under-floor pipes from a nearby cistern or reservoir. Evidence does not support the suggestion that such fountains were intended for use on banqueting tables. More likely they were mounted on metal pedestals and placed within interior courtyards or possibly on small side tables in niches against walls. Throughout the 14th century, Paris remained one of the principal European centers for the craft of goldsmithing and, indisputably, the preeminent center in France. In 1300 there were already 251 practicing goldsmiths in the French capital. The high quality and originality of their work and that of other Parisian craftsmen led the French court to demand precious objects for palaces, court chapels, and private oratories, including metalwork, enamels, ivories, and manuscripts. This aristocratic patronage played a significant role in promoting innovations, especially in enameling techniques. Shrine of Thomas Basin c. 1320–40. France, Paris. Gilt-silver, translucent enamel, pearls, and gems; h. 28.3 cm. The Morgan Library & Museum, New York, Purchased by Pierpont Morgan, 1911, AZ005. This small, highly precious reliquary shrine shares similar stylistic and technical details with Cleveland’s table fountain. 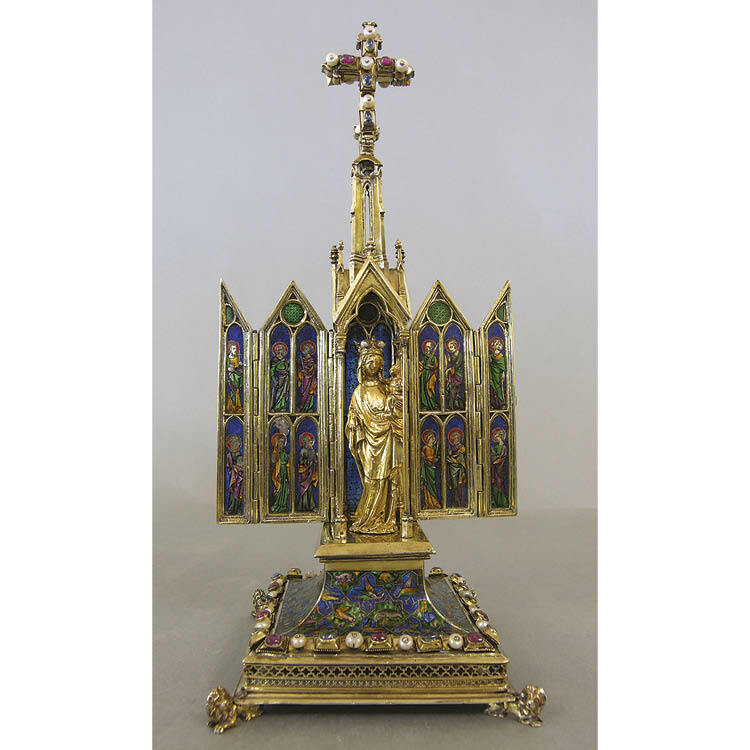 It was made in Paris, the center of basse-taille enamel production in the 14th century. It was at this time that Parisian enamels reached their zenith of fashion and sophistication. The table fountain’s creator presumably would have been aware of the emerging fashion in royal and aristocratic circles for whimsical ornamentation and was certainly capable of producing it for his client. The fountain’s enamel elements are similar to those of several other Parisian works datable to the first half of the 14th century. The history and provenance of the table fountain are of particular interest, though its original owner is not known with certainty. Eight shields bearing eight-pointed stars on red enamel seem to affirm that the fountain was presented to the chivalric Order of the Star, possibly on the occasion of its first feast convened on the eve of the Epiphany (January 6, 1352). The knights of the order wore emblems identical to those displayed on the fountain. The fountain may well have been commissioned by the French king John the Good (reigned 1350–64), founder of the Order of the Star, while still dauphin. It may also have been commissioned by his father, King Philip VI, first of the Valois kings of France (reigned 1328–50). Such a spectacular wonder would have appealed to the new dynasty’s founder as a symbol of monarchical prestige. It remains one of the rarest of medieval objects. Hours of Jeanne d’Évreux (detail, folio 69 recto), c. 1324–28. Jean Pucelle (French, active Paris, c. 1319–1334). Ink and tempera on vellum; 9.3 x 6.1 cm. The Metropolitan Museum of Art, New York, The Cloisters Collection, 1954, 54.1.2. Image © The Metropolitan Museum of Art. Art Resource, NY. Jean Pucelle was an influential Parisian illuminator who completed several commissions for the royal family during his relatively brief career. 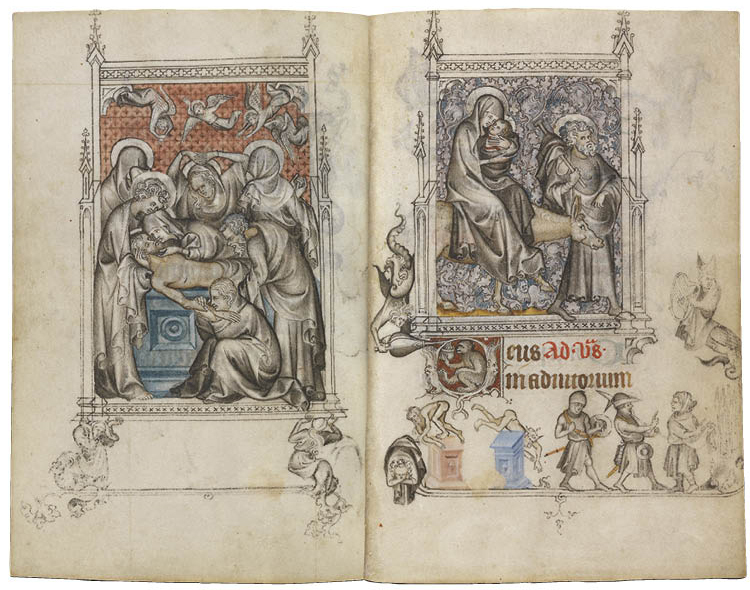 This private devotional book known as a book of hours was most likely commissioned by King Charles IV of France for his third wife and queen, Jeanne d’Évreux, sometime between their marriage in 1324 and the king’s death in 1328. The manuscript demonstrates a common decorative vocabulary with the table fountain, which was produced in Paris around the same time.